10 Questions with webcomic creator James Lawrence creator of webcomic The Legend of La Mariposa & Dangerine! 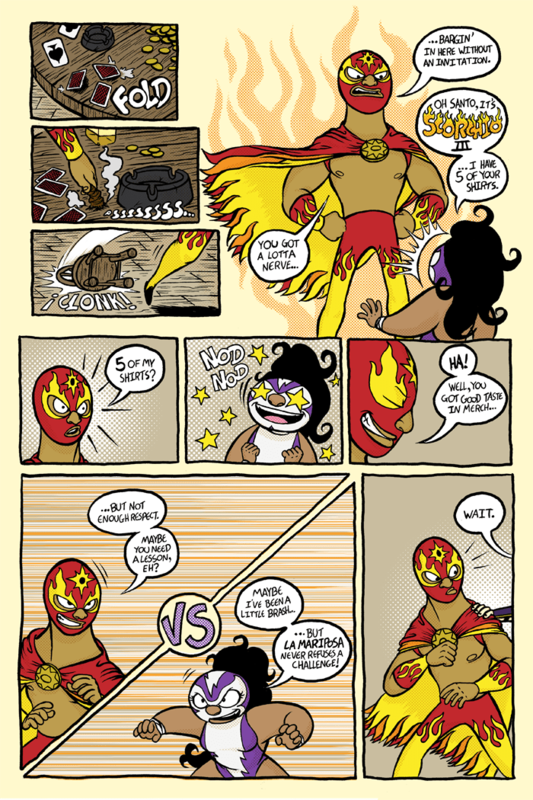 My name is James Lawrence and I am the creator of the lucha libre fantasy webcomic The Legend of La Mariposa and superhero action-comedy Dangerine. I’m also a contributor to Post-apocalyptic horror anthology The Waste. I’d been self-publishing for a few years and was finding myself frustrated by the inefficiency and the huge workload for relatively little reward. I just wanted to get the stories out there for people to read, and digital comics offered that with less admin to take up time I’d rather spend storytelling. Also, with digital comics my potential audience is worldwide! Twenty years ago, your audience was limited to patrons of shops that stock your book or convention-goers that stop at your table. Now, the only barriers to getting my work to the other side of the globe are a lack of internet connectivity and a common language. Terminologically speaking, for me it’s apples and oranges. When I hear “webcomics”, I think of a story serialised page by page (or whatever) according to a schedule, similar to newspaper comic strips. When I hear “digital comic”, I basically think of an eBook, with a whole story, or part of one, delivered in a large chunk. As far as a medium, both have their appeal. I like the immediacy of the webcomic because it allows me to get a page out to the audience as soon as possible, whereas a digital comic is more convenient in its design, being a file that I can carry with me like a book, not having to access a website to get to it. As a consumer, digital comics mean that if a series is cancelled, or I lose interest in it, I don’t have to deal with all those singles taking up space in my small flat. That means I’m more likely to take a chance on a new series that I might otherwise have passed by due to storage considerations. It’s also incredibly convenient. My LCS is great, and I still go there to grab books, but digital comics means that I never miss an issue, and I can browse the marketplace and make ill-advised impulse purchases from the comfort of my own home. Nah. Not for a while, at least. One thing I’ve noticed since the advent of digital comics is that many publishers are really upping their book design game and producing graphic novels that are beautiful objects worth owning based on production value alone. That’s become a big part of my consideration for choosing print books now in a way it never was in the past. They don’t have to vie for the same space in the market. The immediacy of digital comics makes them innately suited for serialised fiction, whereas the sheer range of options for presenting print work enables you to produce beautiful collections that look great on a bookshelf. Ideally, digital and print should complement one another. I am not a computer-savvy individual. I host my webcomic on Tumblr for a number of reasons, not least of which is my complete ignorance of coding and HTML. I’m wholly dependent on templates and tutorials. My website is not nearly as appealing-looking as I’d like it to be, but I tell myself that the story is the most important thing. There’s also an element of privilege to consider as well. Not everyone can afford to drop a couple hundred quid on an eReader as easily as they can a tenner on a cheap graphic novel or a few singles. It is also HARD to promote a webcomic. At cons, peoples get constantly bombarded with information, so they’re not likely to remember to check out your URL. Online you’re dealing with competition for the audience’s attention on a global scale. I can read a webcomic from Portugal as easily as I can one made in the UK, and there’s only so many hours in the day, so I’m going to pick the best one that updates the most regularly. It’s very easy to get lost in the shuffle in webcomics. Rachael Smith’s Bess just started and it’s excellent. Jon David Guerra’s Nightmare Pro Wrestling is a great romp for pro wrestling fans out there. KC Green and Anthony Clark’s Back is bizarre, compelling and hilarious. Eric Lide’s Ozzie The Vampire is a fun shonen-flavoured all-ages adventure. Ze Burnay’s Witch Gauntlet is a darkly awesome Heavy Metal-infused fantasy adventure. From strength to strength, hopefully! The last few years have seen some fascinating developments in growing digital comics as a medium and a business, so I’m full of enthusiasm for their future! Mark Penman’s Eimurian Tales is hands down THE BEST fantasy webcomic available right now. He just wrapped up the first story-arc The Waterbringer and the action and design work in there is just above and beyond. Penman is a gifted comic artist.